These premium tackboards from Ghent feature powdercoated aluminum framing in a rich, "wood look" finish that brings fine furniture to mind. Ovation Enclosed Tackboards are available in one-door and two-door configurations. Both feature radius corners with contrasting trim, full-length hinges, and flush-mount locks with keys for added security. Concealed hangers are included for easy mounting. The one and two door units have shatter-resistant acrylic door panels. Both units contain black fabric tackboards that are fade-resistant and designed to withstand even the most demanding use. 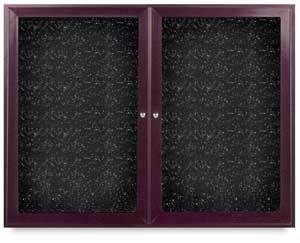 Ghent Ovation Enclosed Tackboards carry a 10-year manufacturer's warranty.